Perhaps needs a slower pace for people over 70. My reaction may be based on my age and the fact that I'm not a 'morning person'. It was stressful to have to make an 8:30 bus in the mornings to head out. Also, experiencing Italy is very affecting and until I took a personal 'day off' there wasn't time to 'process' the experiences. One of my best days was spent on my own in Venice walking at my own pace and stopping in shops or for refreshment. Although a seagull did steal my half finished slice of pizza while I walked in St. Mark's Sq. Something to warn people about and now, "I have a story to tell". Previously discussed. At the pasta making demonstration the woman/cook had a magnificent singing voice which was an exceptional treat. The most enjoyable trip. Our Tour Guide Antonella was terrific. She turned lemons into lemonade, arranging for an evening boat ride to an island that was mostly closed for season and had the restaurant open for us to serve dinner. She showed us places that were a complete surprise and very interesting. Our handsome bus driver Daniele was a marvel, his driving skills are 5 star, very polite in assisting us on and off the bus. Our traveling companions were entertaining, we all got along very well and had some great memorable times. I’m ready for the next Collette tour. Arriving at the gorgeous Regina Palace in Stresa and meetung our tour guide and traveling companions. Everything we hoped for! Driver and tour guide were exceptional, and the experiences were fun and educational at the same time. Would highly recommend this company, especially small tour groups. Really liked going to the BellaDonna winery, making noodles, meeting the owner, and the meal. I did not like the villa because it was too isolated. the trip to all the places were too long on the bus. I would have liked more time in Venice and less in Tuscany visiting more than one frattoria. Do to the rains, we were not able to go to Cinque terre. I became ill. None of these were the fault of Collette but made the trip less than stellar. Thank you for traveling with Collette to Italy. Your feedback will be reviewed by the Product Development Team. The service teams' responsiveness and care was wonderful. The itinerary was very well thought out. Accommodations were good to excellent. The tour director was outstanding. Great tour guide. Good food. Wonderful trip. This was an outstanding tour. The only change would be to limit the time at the leather factory to one half hour. Food was great. Hotels outstanding. But the best was our tour guide, Annajetta. What an enthusiastic lady. The group size of 20 was just perfect. This was my fourth Collette tour in the last three years. You are the best and I will not travel with any other company. Keep up the good work. Great all over tour. Would highly recommend. Excellent tour guide. Made Italy come alive for us. Always helping where needed to make the tour as enjoyable as possible for everyone. She was extremely knowledgeable, fun and enthusiastic. Consistently well located, high quality hotels. Food was delicious and in abundance. Our guide took us to out of the way places that only a native Italian would know about. These restaurants and wineries featured local specialties and delicious cuisine. Great bus driver--safe and courteous. Even the detail of Collette taking care of our luggage enhanced our enjoyment of the trip. Our tour group was congenial. We all enjoyed each others' company. Highly recommend this company to others. There are many special memories. Dinner al fresco in Venice. The breathtaking view from our villa in Tuscany. A cooking class in a beautiful winery snuggled in the country. Walking along the shore in Sestre Levante. Sipping cappuccinos in many town squares. Incredible paper sculptures in Lucca. The antiquity of the buldings and how carefully they have been preserved. The pride Italians take in their homes and their everyday activities. The consistent attention to clean fresh linens, glassware and cutlery on the tables at every cafe and restaurant. Nice to see a total absence of throwaways! Excellent guide in Italy!!! Sergio was informative, very helpful, entertaining, and professional. I’d take a tour led by him again. I thoroughly enjoyed all the places we went. I loved Venice, the lakes in northern Italy, and the Tuscan area. I also loved the day spent in Cinque Terra. One word only FANTASTIC ! All places we went to, Maria and local T M's all again were fantastic. A Tuscan dream come true. It was a dream come true. Our Tour Manager, Maria Pilar was outstanding. The accommodations were superb. The food, the wine, the tours were more than I could have wished for. Our one incident was caused by a local and was handled by Pilar very professionally. She went above and beyond what was expected of her. Looking forward to our next tour with Collette. The small towns were a delight. From our first hotel in Stresa to our last in Venice, the accommdations were great. Our tour of northern Italy was spectacular! Not only were the sites magnificent, but the area was brought to life and the entire tour greatly enhanced by our tour director, Pilar Roccio. Pilar is knowledgeable, enthusiastic and completely involved in making a tour the best experience for each traveler. I experienced so much more than my expectations. Her personable way helped to create a little family of our fellow travelers and us, which made the trip even better. Pilar made such a difference that I hope to take another tour with Pilar. Staying in Tuscany in the Villa Lecchi as a home base for 4 nights allowed us to experience the beauty and food of the Tuscany countryside in the morning and evening, while seeing the sites in Florence, Sienna, etc. The guide, Antonella Regi, was the best guide ever. She was caring, helpful and always full of exciting ideas! A tour with 20 people is great. Our tour guide made the trip a truly memorable experience. The bus driver, Maurizio, was excellent! Could have done without Bologna. 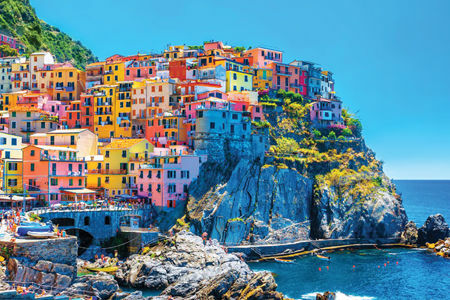 A boat to the Cinque Terra would have been better to get the experience of seeing it the way it appears in your ads! The Tour Manager was wonderful. The Hotels were great. It was a group of 20 which was ideal. I would definitely travel with Collette again. The hotels were excellent and the included meals were fabulous, especially those we had at the villa and the wineries. It's those extras that make the trip. My favorite experience were the tastings, wine and food, fabulous! Everything scheduled was on time and the tour guide kept us informed very well. The hands-on cooking, making pasta then touring the winery. Ate what we had made, a great experience. Lots of fun! You have to go ! I thought the places chosen to visit were very nice. I enjoyed traveling with the small group. It was a good experience. Would have liked to have more meals included; however, I was pleased with all the meals and venues visited. The tour guide was excellent and accomodating in scheduling extra excursions. I also enjoyed the scheduled places visited on our tour. Staying at the Tuscan Villa was a beautiful and wonderful experience. Our guide, Michela Lombardi, was excellent, most attentive to every detail. Itinerary was great! Trip pace was good. 4 day stay in Tuscany was super. There were so many! The esthetic beauty in so many areas, the feeling in body, mind, spirit. The people, the food, the service, the fun! Pretty helpful but we asked for 1st class plane seats and they said they couldn't do that. Our plane and seats changed and we were never told and ended in last seats by bathroom! I called and talked to Sunshine while awaiting getting on plane and she said it wasn't your fault and said I was lying and she wanted to talk to desk attendant who was doing plane boarding. I checked with the attendant before calling you and was told Collette was informed in January after we booked our trip in Nov 2017. THen Sunshine hung up on me. Went to cities I never would have thought to go and they were wonderful. Guide Michela Lombardi was FANTASTIC, accommodations (except in Venice) were wonderful. Loved every minute once we got there and except for Venice-too touristy. And Linda the tour guide on the first island was very hard to understand and too into details of art work instead of history of the building. Thank you for traveling with Collette. A member of the Guest Relations Team will be reaching out to you. Great service, always "with a smile"
This was our first Collette tour and we were extremely impressed with how well everything was organized, and especially appreciated the door-to-door service. We found Collette staff very cordial and helpful, always giving us the best value for our money. One example was during booking air travel arrangements, our advisor noted that the assigned seating on one of our flights was inconsistent with the class of service we had booked, and she proactively contacted us to work through it. And we can't say enough about our tour guide, Michela (Miki). She was not only remarkably knowledgeable, but was unflappable, and went above and beyond in taking me to a pharmacy in Sestri Levante when my wife needed some medication. Her infectious enthusiasm contributed to our entire group quickly forming friendships, some of which have continued beyond the tour. Aside from a minor glitch on our first day (attributable to hotel staff, not Collette), we thoroughly enjoyed every moment of our trip. This was our first time visiting Italy, and our first time with Collette, but it certainly won't be our last! It is difficult to name just one memorable experience, but the highlight for us was the four days spent in Tuscany, and specifically at Villa Lecchi. We felt like part of the family and couldn't believe the beautiful scenery in every direction. The food throughout the trip was unbelievable! Another memorable, and touching, experience was an unplanned stop at the Florence American Cemetery and Memorial just before Memorial Day. It gave us a small glimpse into the appreciation felt by the Italian people for America's role in liberating the country from German oppression. Loved choosing Collette. Best trip of my life! Our tour director made the trip! Collette took care of everything and the choices they made on destinations, hotels and local tour guides was top knotch. But, the tour director made it fun!!! If only we could choose her in the future, but I know that is not possible. She bonded the group and made us laugh, each and everyday. We chose the Italy's Treasures trip. Also called the Food, Wine and Art tour. Best decision we ever made. Tuscany was hands down our favorite! As always, a great, and itinerary fantastic hotels. 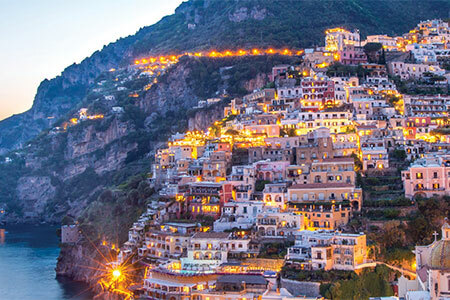 An Italian experience to treasure. Every aspect of this tour was well organised. The blend of content gave a perfect insight into the areas visited and many experiences to remember. This was an amazing tour. Each hotel was memorable for different reasons. 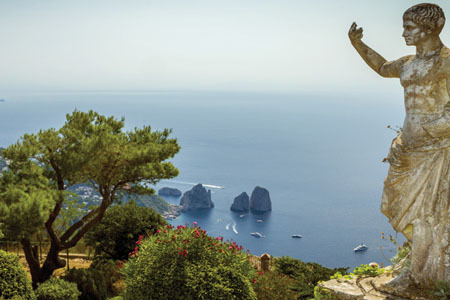 From lakeside elegance to Tuscan country villa each hotel chosen lived up to its promise. Making pasta for our own lunch was an experience and an achievement. Missed some of it but enjoyed what I was able to do. Great company, well-planned trips. Excellent guides and accomodations. Collette is a wonderful group. My husband and I have traveled three consecutive years with Collette and will travel again next year with them. They are extremely organized, the travel host is well versed in the history of the region, and everything is taken care of behind the scenes. I highly recommend Collette to anyone who wants to travel in style and comfort. The hotels are wonderful and the restaurants are excellent. Collette is our #1 choice for travel. We loved our recent tour. The stay at the Villa in Tuscany was great. So relaxing and a beautiful in the Tuscan country-side. The owner was remarkable and the food was exquisite. Our tour hostess was outstanding. Everything was taken care of. All of our adventures were wonderful. The trip was very well planned from our ride to our airport and then home. Our guide, Marco, was fantastic! He was personable and capable and really helped make the trip amazing! Our busdriver, Belagio, was teriffic as well! It was all so memorable!! I loved the Tuscan countryside, the magnificent lakes, Cinque Terre, Venice, visiting local wineries, glassblowing... Truly truly wonderful!!! the fact that trip insurance is included is perfect! Yes, I'd recommend them to anyone. The fact that trip insurance was part of the initial cost was "life saving" to put it bluntly. I had an accident during my first tour 10 Sept - 23 Sept. and if my Italy's Treasures tour manager, *******, hadn't recognized that I was in trouble, I wouldn't be here today. She arranged for a Dr to come to our hotel and followed through with me. I ended up in a hospital for 12 days receiving excellent care, eventually being flown home with a nurse ******. I had a subdural-hematoma and surgery to correct it. My only regret is I never saw Venice! I will go back! Everything! It started with the sedan service to the airport. Flight was easy. Our trip to Italy was amazing. We went to so many places and did things we never would have thought of but these were included in our tour. Hotels were awesome, food delicious and our tour group was so much fun. Everyone had a great time plus our tour manager, Tina was the best as well as our bus driver, Lorenzo. The trip was better than I had hoped! Every town, village and city were remarkable with their architecture and art work from hundreds of years ago. We loved Tuscany and staying in a villa, making pasta, tasting wines in so many places. The activities and restaurants included in the tour helped make this adventure a extremely memorable experience. We loved the gondola ride in Venice also. Tina took us places that we would have never seen on our own. She was organized and knew how to navigate towns and high traffic areas based on time of day. It was our honeymoon and she took time to add details to make the trip extra special. Siena was absolutely breath taking! Venice was so unique and beautiful. Staff was very helpful when I called to book. Transfer from airport to hotel went smo I thky. Our guide did his best to prvide for us. Would have rated higher but tour bus was awful. Way too small and uncomfortable. Suggest you include tips in cost so you're not having to constantly worry about tipping. Really enjoyed Sienna and Venice. Cinque Terra has been ruined by all the tourists. Enjoyed the wineries and the inclusion of wine with meals. Italia...fantastico.....The tour was well paced, very educational and included a wonderful group of fellow travelers and awespme tour director.....Eccezionale! We loved the group size - 24. We left the tour as friends, email addresses and all, talking about doing another trip together again! Our guide- *********** was absolutely fabulous!! Very knowledgeable and very personable. One thing that we really appreciated, our bags were lost in route (KLM canceled a flight and we were rerouted) and ***** got right on it. She dogged the Milan airport people until they showed up. Very fond memories of the whole trip. Great job. Our favorite stop was the first few days at Stresa. Of course we would like to go back to all of the places, but Stresa was out favorite. We had excellent service from our tour manager and bus driver. Very helpful and friendly people. They were both very knowledgeable about the area we were in. The tour was everything we hoped it would be. *******, the tour guide was outstanding!!! Great group of people on the tour! Liked the small group--24 people. Again, the tour guide, ***** and the bus driver, ********** were the best of the best!!! This trip was an absolute favorite of all time! I could have done the trip over again in a minute. ******* was just an exceptionally good tour guide. She went above and beyond and made it a great experience for us all. We loved all of the accommodations and activities included on this tour and the food was beyond what we expected. Loved it all! We feel that the dollars spent on this trip was worth every penny. Our expectations were truly exceeded in every way from the experienced guide, Pilar, to all of the accommodations that were included and the many experiences. Did I mention the food? Unbelievable! The hotels, activities and sightseeing were well chosen, planned and executed. This was an overview trip and there are several places I'd like to revisit and spend more time. However, I have to say that a good deal of my praise goes the amazing tour manager that we had. He was extremely well organized, attended to detail and was one of the most amusing people I've ever met. Collette is extremely lucky to have him. He really cares about his job and his groups' experiences. Hard to pick one; each town was unique and wonderful on its own. I'd have to say that Tuscany was great, especially the winery and medieval town that we visited. Great experience and we will definitely travel with Collette again. Over all wonderful trip. Everything was well organized. Great local guides in every city. Restaurant choices for group meals were perfect. Our Tour Manager was loved by all. The whole tour was great! Wonderful experience. Would definitely use Collette again. Every day was wonderful and full of new places and experiences. The 4 nights in Tuscany were my favorite. The views from our hotel were magnificent. Loved the Tuscan countryside. It was just as I imagined it. Pick up at the terminal agent not visible took half hour to locate and was not in the area noted on the arrival information. Out of pocket meals were more than expected and too much free time in areas not located near major towns. More museum options should be offered instead of roaming the city and free time. None. Too much down time and the time of the year is too hot and too many tourists. One of the best trips ever of many I have taken. Over the years this is my 4th trip with Collette and I have been happy with all of them. 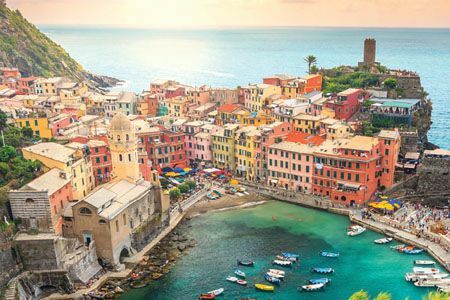 In particular, Italy's Treasurers had us staying in the best places outside of large cities (except for Venice, of course) in picturesque villas seen only in movies. The whole experience was exceptional. Our guide *personal details removed by Feefo*, was outstanding. The only complaint was with our flights on American Airlines. Ancient equipment, food that was literally inedible and mostly surly flight attendants. I was embarrassed "America" was part of their name on an international plane carrying foreign passengers. Living the dream of beautiful Tuscany. Just a little to much walking. Could have done with another half day of freetime. Enjoyed everything about the tour. The culinary experiences and tastings were a wonderful added touch. good experience, normally enjoy a "guided" tour but this one had too much "free time" (I don't shop I go to see new things) I was very disappointed at the lack of guidance from the tour guide for the "free time" in fact we eliminated a stop so that people could go "Shopping). The TG did do us a few favors but there was always confusion in the direction & orders and often the message did not get to us. She was very knowledgeable and was good with the locals (spoke fluent Italian) but most of the time we didn't know what was going on next. I like certainty and order and it was not evident .Did I enjoy the sights and activities, you bet! but I'll be more selective in going on another Collette tour before I get some questions answered and know what I'm getting in to. What do you mean by "headline"? From the first when we decided on this trip I asked questions. They were mostly answered. A couple times I had to ask twice on an email and finally called and talked to a person. Overall the tour was awesome. We took this tour because it was going where we wanted to go. We really liked the small travel group. One reservation, though. Wish Pisa was part of the itinerary. Can't imagine going to Northern Italy and NOT going to Pisa. We found a service to take us and a local guide to assist us once we got there along with 10 additional travel companions. Several days there was too much "free time" for shopping. The time could have been better spent with a guide. Many many memorable experiences. Our guide spoke great Italian and the local guides were all excellent. Our coach needed some cleaning. A few days the smell was hard to take. We would recommend this tour to those who want to go to northern Italy. Food and wine tasting experiences were above and beyond. Poor value based on the price. Very expensive. Poor value for price paid, overall, and hotel in Tuscany was a penal colony, absolutely nothing to do during down time except by pricey cab ride away (20€). Swimming pool /sauna cost 20€ for 1 use! Enjoyable trip, great selection of sights and events. The Tour Manager was excellent. The Bus Driver was excellent. Everything proceeded as planned. The Tour Manager was very outgoing and went out of her way to make feel welcome to Italy. She way always there to answer questions, gave sound advice and completely/clearly explain was going to happen each day. She addressed the needs of each tour member and efficiently took care of any special needs individuals may have required. She fostered a warm friendly atmosphere for all. Sights and sounds of Italy. The hotels and the meals provided by Collette were great, as were local guides and experiences. Downside: our tour mgr was too young. Loved Siena, Lucca, winery tours, provided dinners. Gondola ride was overpriced ($75/each). 7 excellent days, 3 so-so days. The airport plckup was late and two tour stops were unimpressive. The rest was delightful. If I hadn't been to Florence before, I would have been disappointed at the omission of important museums. It was a wonderful trip in all regards. We loved being in a small group, both our guide and driver were excellent. Just a grrrreat trip. 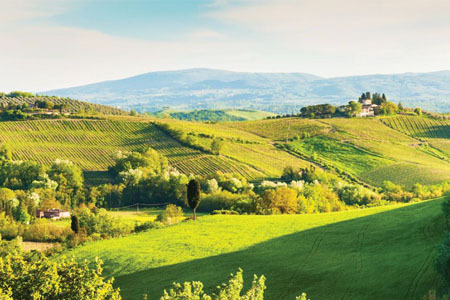 The Tuscany region is just beautiful. We couldn't find a bad bottle of wine, nor a bad meal. Knowledgeable tour guide, very nice hotels and food. Also day trips were very good. Overall great tour. Favorite outing for me was organic farm dinner. Favorite town was Senna. Our tour guide was so good she made Italy come alive. This was not a "high service" transaction, we paid our money and received our documents. Found no value to the printed bag from Collette. I liked the design of deeper exploration of a smaller area, especially tasting of wine and foods of areas. Would enjoy other small group tours. I felt this tour was well planned, though I question the value of including the Cinque Terra, as it is so crowded. Loved all of the other included tours, enjoyed having free time. Tour manager was literally a fountain of information and history, but, treated the group a bit more like seasoned travellers" , which many were not! Could improve emphasis on meeting times and places, but other than that fine. Great hotel locations and destinations...tour manager was just 'eh. The hotels were in great locations, although Venice hotel was very dirty. Most destinations were beautiful....skip Bologna. It would have been nice to include the Accademia in Florence so we could see the David and to offer an optional weather permitting Boat tour of the Cinque terre. The tour manager was not interested in helping us plan anything other than was in the itinerary....she told me she "deflected questions" about anything that was not related to the tour we were on....she said, "why are they asking me about Switzerland...they don't need to know that." Our American Tour manager took the wrong train in Cinque Terre and spoke very poor Italian....she also lost a person on tour in Bologna....an Italian tour manager would have been better!!! My most memorable experiences I did on my own...a boat tour to Cinque Terre and we took a taxi to San Gimingano....really the bus driver couldn't take us there? It was about a 10 minute ride from our Villa. The Tuscany landscape was beautiful...it would have been nice for bus driver to stop for pictures of lavender field, poppies and sunflowers, as well as picturesque hill top towns. The trip rocked. We saw so many beautiful places and had a great time tasting the wines and cheeses. We had a wonderful time on this trip. Our tour guide was a delight and knew how to balance professionalism with fun. This tour was very rigorous and had one heck of a schedule. The things we got to see on this tour were both intimate and informative. The places we stayed were perfect and most of the food was good. The one disappointment for me was the cooking class. It was lame. The woman showed us how to make pasta by hand. I got to knead the dough for 1 minute. My vision for a cooking class was having someone take us to a market to purchase the fresh ingredients and to actually make a meal and eat it. Maybe a half day experience. I had seen videos of this type of class on line. A suggestion also... maybe have a bit more free/down time to explore and maybe catch our breath. The Cinque Terre experience would have been better if we could have done it by boat rather than train. I was hoping to take some beautiful pictures of the coastline of these cities. All in all.....super fantastic trip. Thank you Kathleen and the wonderful guides we had in the places we visited. Thank you Collette. My favorite part was touring the agritourisimos and tasting all of the wonderful wines and organic foods they grew and made themselves. The group of people on our tour made it amazing. Loved them all! Miss you! The Tour Manager was not a very good. She was not answering questions she was more interested in deflecting question. She was not around most of the time. Just not overall helpful. However the hotels were good and the locations for excellent. The food and the hotels was below average. Favorite memorable experience was the boat ride to the Chicque terra that was not part of your tour. Thank you for choosing us for your recent tour. Maintaining a high level of quality is our number one priority. That priority is extended into every aspect of a vacation experience- from your airfare to transfers and from meals to hotels. We are, therefore, disappointed with some of the information we received regarding your tour manager and the accommodations. Your comments have been forwarded to the tour manager’s team leader, as well as the Director of Tour Management. They will review this with the tour manager personally on a separate level. We have also passed along your feedback of the food and hotels to the product team in order to help improve our tours for future guests. If there’s anything else you would like to share with us, please pass it along. Your feedback is greatly appreciated. 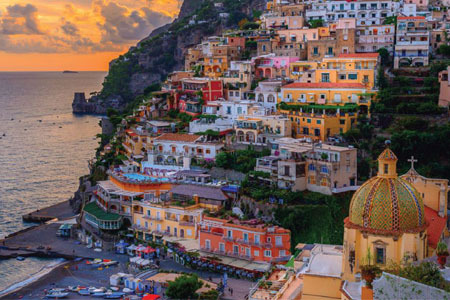 Our trip called "Italy's Treasures" was excellent from start to finish. Even though I had been to many of the sights previously, I thought the guides were very good and I learned a lot. I would have liked a bit more free time, but think that is just me - the group seemed to like the pace. To answer your question, the service given by Collette US was excellent. my favorite experience of the tour was staying in Stresa - I loved that town and will go back. I also really enjoyed the visit to Lake Orta and the "Way of Silence"
Most national museums in Florence, including the Uffizi Gallery and the Academy Gallery, are closed on Mondays. Explorations air guests will arrive into Milan airport and depart out of Venice airport. All Explorations departure transfers will depart from Venice city center to the Venice airport. *The dinner at Isola dei Pescatori is held from April to October; from November to March, dinner will be in the town of Stresa. **Note that villas in Tuscany are dotted throughout the region and we use different properties on this program. Some may be located in the countryside, removed from a city center. Still others may be closer to the hustle and bustle of the region. Each one is unique, full of history, has many amenities and is brimming with true Tuscan flavor. This is part of the fun! ***On occasion, due to inclement weather, your boat trip to Murano Island may be substituted with a visit to a local glass factory in Venice.